I loaded all of the pictures into this post and titled it on December 23rd with every intention of logging back and and writing something shortly thereafter. Well, here it is on January 5th and I am finally getting around to it. First off, let me apologize for the lack of blogger etiquette and wish everyone a Merry Christmas, Happy Hanukkah, Happy Boxing Day (linked because I had to look it up myself), Happy New Year, and/or best wishes for whatever holiday(s) you celebrate this time of year. Whew. It feels good to get that out of the way! Needless to say, it's been a whirlwind couple of weeks. The days and weeks leading up to Christmas were kind of a nightmare, due in no small part to the fact that I bit off a little more than I could chew with making homemade gifts (hence the relief implied by the title of my post!). Pictures of all of the gifts I made are at the bottom of this post. I was literally uploading the pictures as my wife and kids were waiting outside in our packed minivan! On December 23rd, we set off to Greensboro NC to spend the Christmas holiday with my wife's family. It was a nice visit, and my brand new nephew was baptized on Christmas morning. From there, we drove 12 hours up to New Jersey to stay a night with my aunt, uncle and grandmother. On the 28th, we continued on to New York City where we stayed with my mom in Brooklyn through New Year's. On Friday the 2nd, we made the 13-hour trek back to Raleigh. We had a nice enough trip and, of course, it was great visiting with family. But we decided that this is the last year that we'll be traveling for Christmas. For starters, the traveling is completely exhausting and, even with 2 weeks off from work, we don't feel like we had much of a break. That's a shame. And more importantly, it's time that our kids are able to wake up in their own beds on Christmas morning and for us to start making our own traditions. I think we've reached a point where it makes more sense for the grandparents to come to us on Christmas, rather than vice-versa. So that's my holiday break in a nutshell. Now, on to what you really want to see ... pictures! I love this Simplicity fabric and I've been on a tear with it. I made a deal with Emily to buy some of the scraps from her daughter's quilt. Thanks for the scrap bag, Emily -- I'm getting a lot of mileage out of it! My favorite is the "words" fabric ... I put "family" at the center of this design. It's made from another of my favorite lines: Park Slope by Erin McMorris. The funny story is, I had a FQ bundle from this line on my birthday / Christmas list, and she (not so subtly) hinted that she's love something made from this line for Christmas. The original intent was to make a quilt but ... yeah, that didn't happen. Actually, I got all of the blocks made, but ran out of time to assemble it. Maybe for her birthday. Or maybe I'll just keep it. A close-up pic ... I've been on a free-motion bender lately! 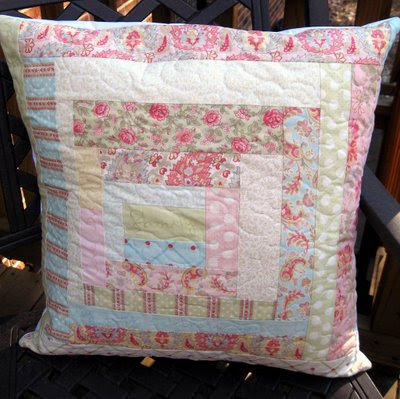 Another log cabin Simplicity pillow -- this one was for my mom. She had often commented on how much she likes rectangular pillows and wanted one for her couch. So instead of buying her one, I decided to make it! 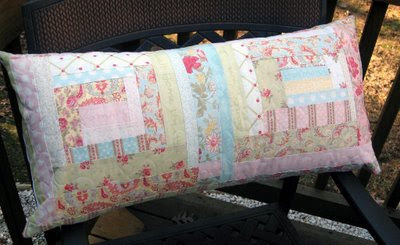 Again, free-pieced and free-motion quilted. 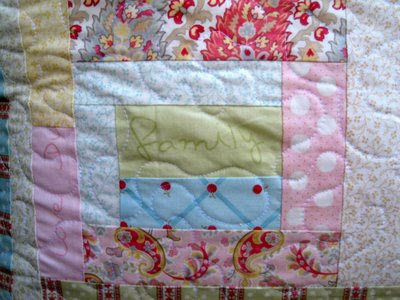 This one features "family" and "harmony" in the middle squares, with some other words scattered throughout. Remember my Giveaway Day tote bag? Well, it was one of three. The other two were gifted. 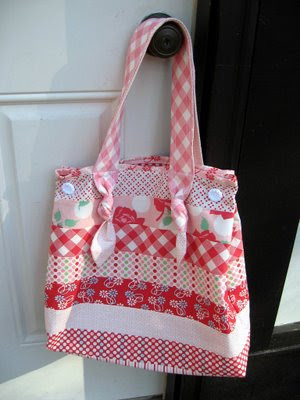 This one, made from pink and red Swell fabrics, went to my grandmother. 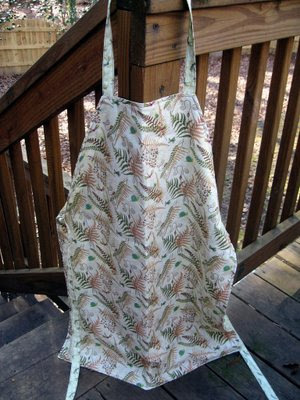 Next, I made an apron for my aunt -- she's an amazing cook and actually wears aprons ALL THE TIME while cooking, so I know this one will get a lot of use. 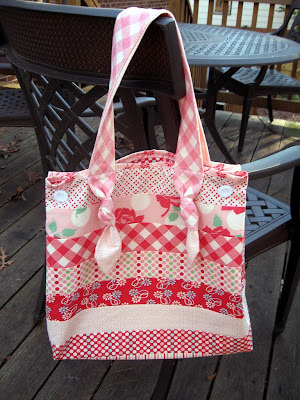 I got the (free) pattern from the Spool Sewing blog (one of my faves!) and used some cool new Debbie Mumm fabrics from Joann's (50% off before the holidays!). 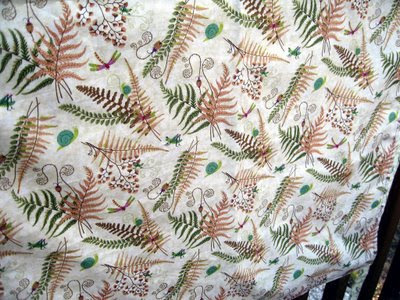 Here's a close up of the front fabric -- ferns and bugs. And finally, I gave my grandmother a quilt for Christmas. I figured if anyone deserves one, it's her. I actually started this quilt in my Beginning Quilting class one year ago this month. I pieced it in the winter, basted it in the spring, quilted it over the summer, and finally bound it before Christmas. (P.S. Don't look for any close-ups of the binding. I machine-bound it to save time, and it did NOT come out very well. Luckily, I don't think it's very noticeable ... but it was certainly less than ideal). 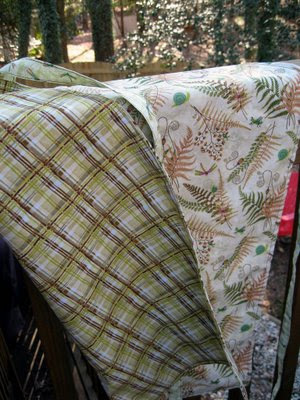 The fabrics are from the Folklorique line from Fig Tree Quilts. Basic rail fence pattern -- hey, it was my beginner's class! I like that it's kind of Christmas-y, but doesn't have to be. And that's it! Thanks for looking at all of my pictures -- I know it was a lot, and I am somehow unable to pick only 1 picture of each project! I hope all of your homemade gifts were received as warmly as mine were. I am very impressed with all of your gifts! I have recently started reading your blog and I love following others who like to be creative! Thanks for the inspiration! Holy Cow! It's now wonder you've been so quiet! These are all lovely! Incredible! Your gifts are beautiful and some very lucky people received them. Love those pillows. I think I'll have to look into making some myself! Beautiful. I think you did much better then me on the handmade stuff. I only finished a few things. Hi John, so happy your Christmas and visiting went well. I love looking all the pictures and reading about how it all came together. Great job on all your projects. Wow! You were quite busy before the holidays. They are all beautiful. I had never attempted hand quilting the binding but once I did I'm hooked and feel awful when I'm rushed and have to machine quilt it. I am looking forward to seeing what you come up with this year!!! 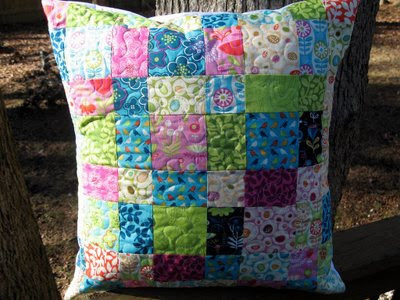 I love your quilted pillow made with the Park Slope fabrics! The colors you used are amazing and I love how they all work so well together. We really do have some of the same (good) taste in fabric. I love all the Fig Tree stuff, and I bought the whole bundle of Swell. You are certainly right on your decision to stay home for Christmas now, while the kids are still young. Happy 2009! impressive gifts!!! 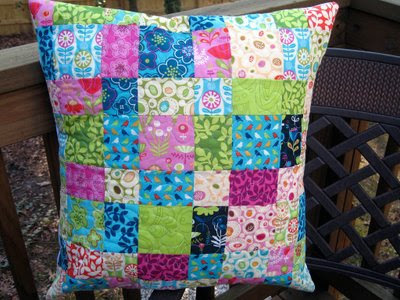 i love the fabrics that you used for each of the projects. i have been too chicken to make pillows (can't commit to a design or colors), but after seeing your post, i just HAVE to. I want to be in your family!!! I can honestly, hand on heart, say that if I opened any one of those gifts on Christmas day I would have been overjoyed. And your free motion quilting is looking great. Dare I try it? It's got to happen at some point, hasn't it?! Great job on on the gifts! They're beautiful! We don't go anywhere for Christmas. DH used to have to go to 5 Christmas' so we stay home no matter what. Gorgeous gifts!! A lot of lucky people in your family this year. 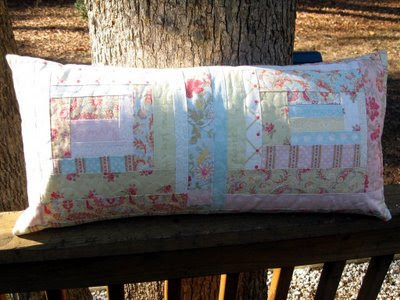 pillows do make great gifts. how do you finish them...zippers? envelope closure...buttons? Lovely gifts you gave your family! Are you going to tell us if you got the laptop you wanted so bad? I got one for Christmas and thought of you, hoping you got one too! Don't apologise for all the pictures, I like to see plenty of picures in a blog. Everything you've done looks wonderful. I haven't seen the Park Slope fabrics before, I love them. We have Boxing Day here in the UK, I didn't realise you don't in the US. My brother doesn't live far from your Mum, he's in Manhatten. Wow. How does one get to be on your Santa list?? Beautiful gifts - I especially love the laptop covers - great fabric choices. i am always impressed by your color style. Happy New Year. Oh, and I agree about the kids waking in their own house on Christmas, btw, if you need another vote of support. I always love hand crafted gifts the best and yours are amazing! Your gifts are truly wonderful! I love the pillows. It sounds as if you had a busy holiday season. We travel too and it does make it fun but tiring. I remember when my family started having Christmas at home and I loved it. It was so nice to not have to pack everything up the afternoon you recieved it and be at home to play. I hear you about the whole travelling thing at Christmas.My dad has been ill for the last 4 Christmas's and so we always went down to the States. But he passed last February and so it was our first Christmas in Canada in a long time. Our kids were so much happier and my mom needed a change of scenery this year. Your gifts were beautiful! You certainly did a lot of sewing! I've decided to start making gifts in February for next Christmas...maybe I'll get them all done this time! p.s. Boxing day here is like Black Friday where you are. Same shopping frenzy, different day. Wow, there's a lot of great work in this post! I completely understand about travelling for the holidays. Luckily we moved back to Adelaide (and all our family) pre-kids, so only ever had to do it as a couple - infinitely easier! We've just been to the IL's holiday house a couple of hours north for a week, and the effort is huge, despite the house being all set up! Your handmade gifts are just amazing. Does Mrs. Quilt Dad know how lucky she is? Most dads I know just blump on the sofa watching TV..on their time off... (and what a waste of precious time). 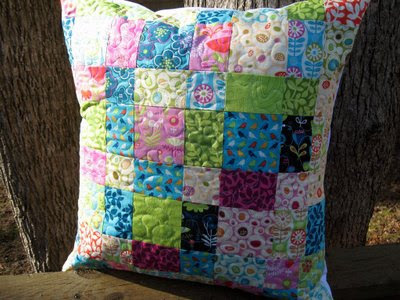 I love your pillows and your courage with free style machine quilting. 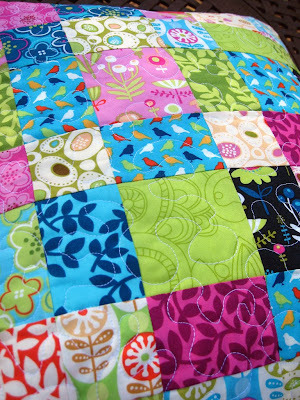 Which by the way is terrific.. That is my goal to never tie another quilt - but to machine quilt. Doing pillows is such a great way for me to learn. I also love your log cabins. Thank you for such inspiration.